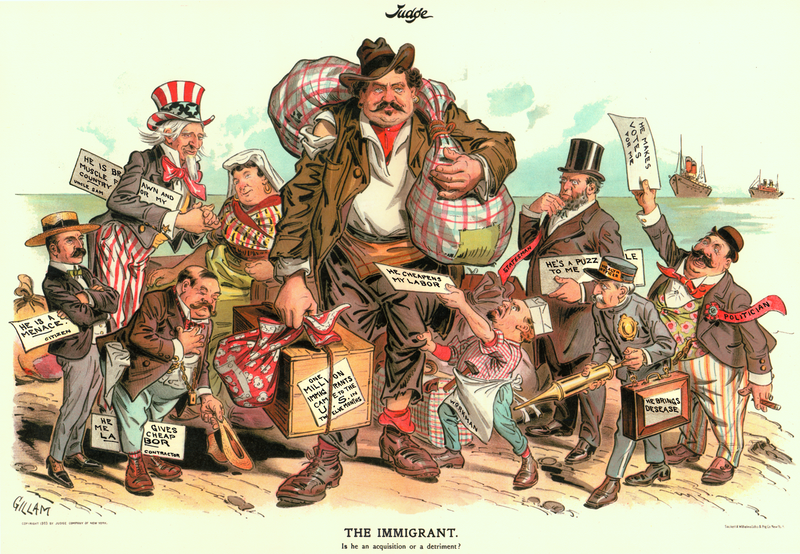 This 1903 cartoon presents the different perspectives that Americans had about the large number of immigrants entering the U.S. at the beginning of the twentieth century. It appeared in Judge magazine, which used humorous illustrations and short essays to comment on current events. The Immigrant. Is he an acquisition or a detriment? Source | F. Victor Gillam, "The Immigrant," chromolithograph, Judge, 19 September 1903; from Library of Congress, Prints and Photographs division; http://hdl.loc.gov/loc.pnp/cph.3g03659. Cite This document | F. Victor Gillam, “"The Immigrant",” HERB: Resources for Teachers, accessed April 20, 2019, https://herb.ashp.cuny.edu/items/show/649.